Stu-Arts Stands are beautifully hand-made, fully adjustable, strong, sturdy and lighter than most other stands on the market. 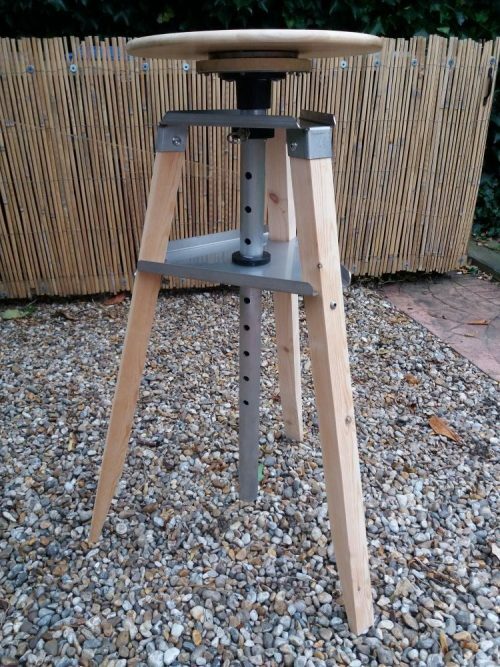 The tripod legs are made from quality wood of your choice (sustainably sourced hard or soft wood), braced together by the use of engineered, rust-free stainless steel. It can be quickly and easily assembled/dissembled. The turn table runs on bearings (unlike most other stands that turn on the pole). The result is a light, smooth rotation where strength is not compromised. Where there would be unwanted movement in some stands, Stuart has added bushes to his to ensure rigidity when sculpting. Stu-Arts Stands allow me to work on pieces away from the studio (such as craft fairs or small spaces) and allows potential buyers to view my sculptures from 360 degrees with limited risk of damage. They also improve the quality of my stall, adding a value to what is being sold! Stu-Arts Stands are tailor-made and versatile. They can be utilised for not only sculpture, but model making, cake decoration, floristry, or any other craft or occupation where you need flexible access and a smooth action. It is a quality hand-made construction that should last you a lifetime. We aim to deliver within two weeks of your order.